Alpine WY is a mere 36 miles from Jackson Hole. Mountains, forests, rivers and reservoirs provide many opportunities for all types of outdoor recreation. Annual snowfall averages 500 inches making winter sports such as snowshoeing, ice fishing, downhill and cross-country skiing readily available. The town of Alpine WY rests against the mountainsides at the convergence of three rivers, the Greys, the Salt, and the Snake River. All three of these rivers merge and flow into the Palisades Reservoir. Because of its close proximity to Jackson Hole, many who work in Jackson make their home in Alpine. Alpine also provides visitors with a small town atmosphere and an abundance of activities for every season. Alpine is located at the southern end of the Snake River Canyon where the Snake River enters Palisades Reservoir. 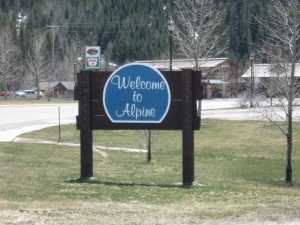 Because the town is located at the junction of US Route 89 and US Route 26, one going north and one going south, it is sometimes referred to as Alpine Junction. Although a small town regarding year round residents, Alpine has several lodging facilities, good places to eat, gas stations, and grocery stores. Due to the increasing popularity of the area, you will also find several real estate offices in town. Alpine also has a library, a post office and a new recreation center. Palisades Reservoir provides water activities for all – boating, jet skiing, fishing, water skiing, and much more. The Greys River area offers over 471,000 acres of virgin national forest and summer recreation ranging from kayaking and white water rafting to camping, fishing, and countless miles of trails for hiking or horseback riding. For the naturalist, a large wetland and waterfowl viewing area is only a few miles drive out of town. Annual snowfall averages 500 inches making winter sports such as snowshoeing, ice fishing, downhill and cross-country skiing readily available. There are over 150 miles of groomed snowmobile trials. - Alpine Feed Ground: Operated by the Wyoming Game & Fish at the edge of town, this area draws nearly one thousand elk from December to April. - Palisades Reservoir: Recreation is found on this 25 square mile reservoir with 70 miles of limited access shoreline year-round. Even the fishing season is year-round. - Bridger-Teton National Forest: The Bridger-Teton offers more than 3.4 million acres of public land for your outdoor recreation enjoyment. - Mountain Days Celebration: Alpine is the home of the annual 3 day Mountain Days Celebration which features mountain man activities, crafts, dancers and much more. - Greys River Road Grand Loop: You can start this scenic drive at Alpine and travel 80 miles on gravel roads, arriving at a destination about 15 miles south of Afton. The beautiful scenery is combined with great history. To get to Jackson Hole from Alpine, take US Route 89 northeast and travel through the scenic Snake River Canyon for a distance of 36 miles. If you travel this route in the summer, you can stop along the way and watch white water rafters making their way down the Snake River. In the winter, the road can be covered with snow and ice, so plan on taking your time and enjoying the pristine white wonderland.